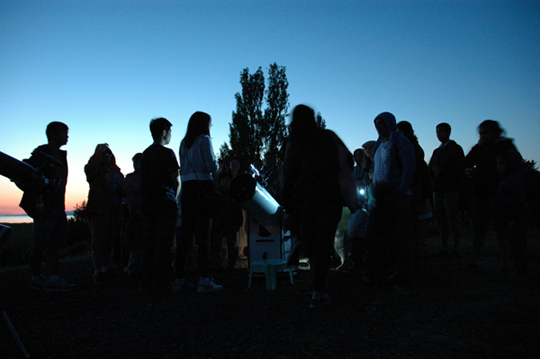 In collaboration with Richmond Nature Park, the Sky-Watcher team had an eventful night with the community, gazing upon planets and stars in the summer night on July 29th at Terra Noval Rural Park in beautiful British Columbia. Around 50 people attended the event, from eager children to enthusiastic parents. We were pleased to provide our Sky-Watcher line of products for everyone to enjoy; including two 10” Sky-Watcher SynScan Dobsonians. Little campers from ages 5 to 14 had a chance to see through a telescope for the first time. They were able to see the Moon and its craters, Saturn and its rings, as well as looking closely at Mars for the first time. Parents also had a wonderful experience and were impressed by our telescopes’ ability to pick up enormous detail and clarity. We like to thank everyone who attended the event, along with the Richmond Camp Coordinators that help made this happen.